One thing most indoor plants love is sunlight – lots of it. And while HID, HPS, and MH lights can mimic the rays of the sun, they aren’t energy-efficient and will drive up your electricity bills – which is the last thing you want. For these reasons, LED grow lights have become the go-to lights for growers looking for high-functional and cost-effective lights with low power consumption. When buying aLED grow light, there are three important things to consider: The LED chips, the power output, and the spectrum. The grow light must have at least 3w LED chips as lesser ones will not give your plants consistent light coverage. The light output must be at least 300w as LEDs never give 100% power, so you’ll end up with slightly less wattage than what’s mentioned. When it comes to the spectrum, it’s the reds and blues that matter. The blue segment should have a range of 440nm-470nm and the red segment should have a range of 640nm-660nm. 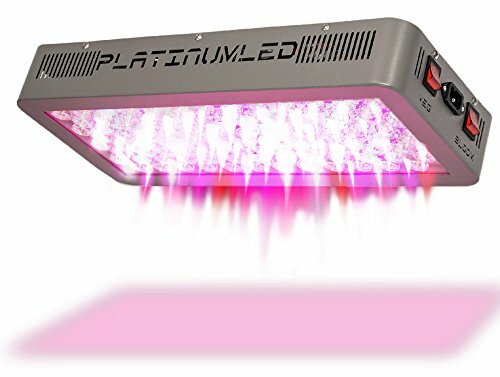 In our endless search for the best grow lights, we came across PlatinumLED lights, made by a company located in Kailua, Hawaii. The company produces high-quality grow lights that emit more light than their counterparts while using less heat and energy. Here are 12 we love. 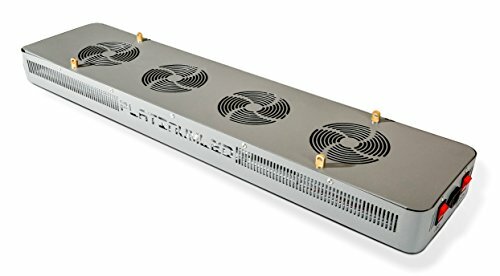 A perfect replacement for an 800w HPS grow light, there are many things to love about the P600. For starters, it only consumes 368 watts while generating 600 watts of power. Secondly, its 12-band full spectrum gives your plants all the light they need for maximum growth. Thirdly, the 5-year warranty and 90-day return guarantee show the manufacturer has complete confidence in their product. The P600 gives maximum coverage to a 4-feet grow tent and distributes light evenly to the edges. Its long and narrow profile makes it a flexible light that is ideal for growing areas of different sizes. Raise it 18 inches above your 6ft x 4ftgrow bed or use multiple units to cover a larger growing area. You can control the spectrum using the two buttons on the side of the unit. The light’s biggest downside is that it comes with a hefty price tag and growers who are unaware of its long-term benefits may be put off. 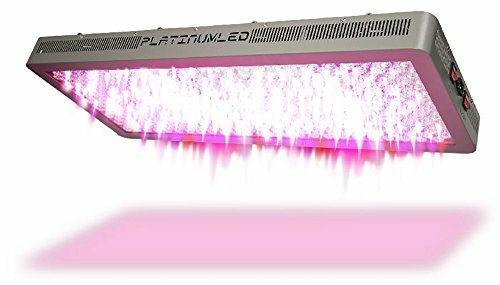 Perfectly combining energy-efficiency and affordability, the P300 isPlatinumLED’s most popular grow light. It is suitable for both small grow beds and larger operations. In less than 24 hours, your plants’ leaves will have a lot of detail and pronounced ripples. Two switches allow you to fully control the light spectrum during the vegetative and blooming stages. 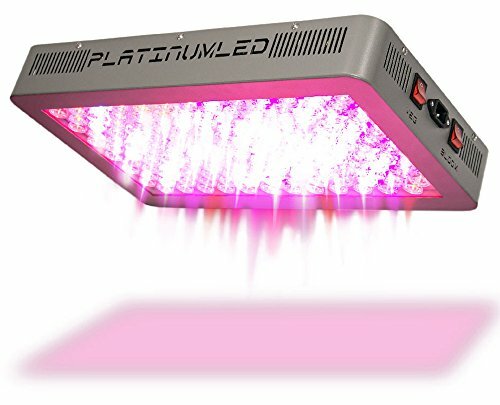 The LED grow light uses solid-state lighting devices that cover the high photosynthetic active radiation (PAR) sections of the light spectrum. The P300 has an average power draw of 180 watts (and a 300w power output) and is a great substitute for a 400w HPS light. It is recommended for a growing area of 4.5ft x 3.8ft. 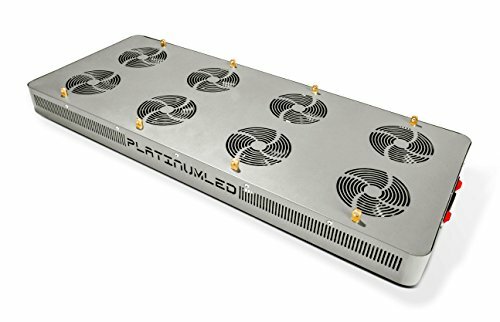 There's no additional cooling needed as it has a very low heat output and is fitted with aluminum cooling heat sinks and 2 high-speed fans. The only thing you may not like is that it doesn’t have the coverage the manufacturer says it has. At best, its maximum coverage is 3ft x 2ft. The light spectrum is one of the things that tell us how powerful a LED grow light is. This is because specific wavelengths of blue and red light are highly effective during photosynthesis. The P450 has 12 wavelengths of color output – all the lights plants need from seedling to maturity stage. The light is the perfect replacement for a 600w HPS light because it only uses 250 watts of electricity while producing 450 watts. It consumes less energy and heat while keeping your plants healthy and strong. 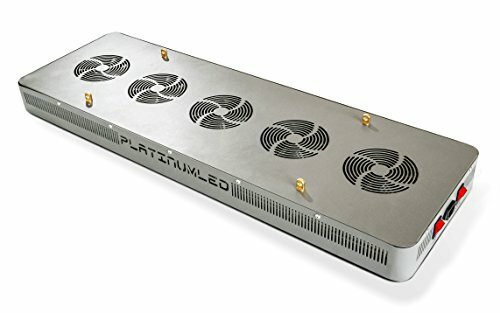 Its cooler running 3w LEDs have a higher output and are more efficient than their LED counterparts. A word of caution: the P300 and P450 emit very bright light and can burn plants when placed at the recommended height of 18 inches. For the best results, place the light 24 inches above your plants and keep lowering it as the plants grow until you find a perfect height for it. 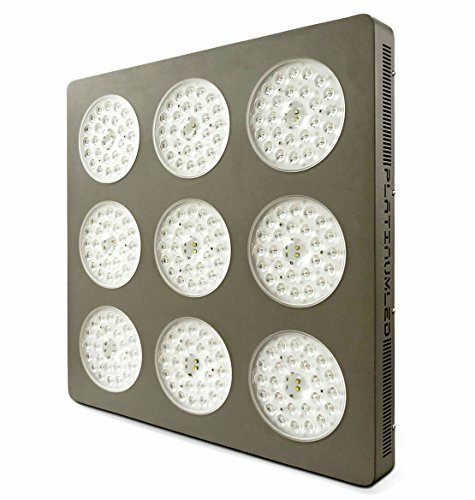 Area - 3x3 bloom at 18"
Your plants will love the amazing light emitted by the P4-XML2. It produces very strong and healthy plants. You can easily set it up and control the temperature in your growing area. Use the light in a grow tent to significantly improve plant quality and yield. It gives off less heat, creating a favorable environment for growth. The extremely powerful current control by advanced LED drivers ensures the XM-L2 10w CREE LEDs have a long lifespan. They can last up to 11 years with very little luminosity drop-off. But since PlatinumLED only gives a 5-year warranty, the light may not last that long. The light’s PAR per watt is higher than that of other lights in the same category. 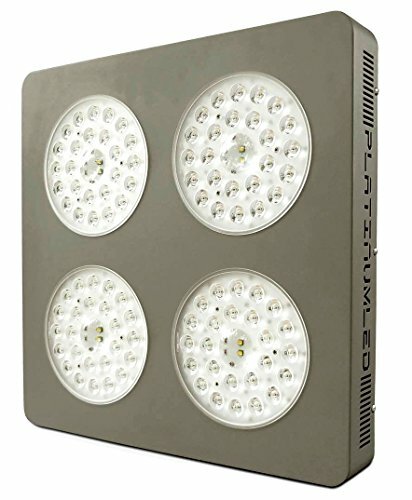 PlatinumLED has included a focusing lens system with 120-degree convex lenses for the LEDs that boost canopy penetration and enhance spectral coverage. 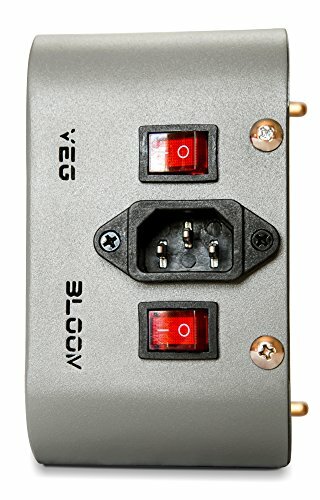 Three switches give you total control over the power output. Complete 12-band full Spectrum including UV/IR + 2x 10W Cree xm-l2 LEDs per cluster - 38% higher output than older XML models! 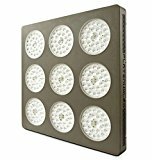 Area - 3' x 1.5' at 18"
This is a perfect light for first-time growers or those starting to experiment with LED grow lights. It is a high-quality light sold at a decent price. It comprises 503w US-made LEDs that produce a much higher PAR than other 3w LEDs. 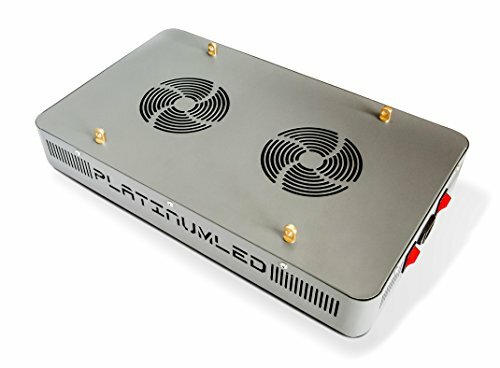 To ensure your plants receive more light, PlatinumLEDhas added right-angled secondary lenses. Instead of using a standard on-off switch for the light spectrum like other grow lights, the P150 has two red buttons that allow for fine tuning of the PAR during the flowering and vegetative stages. Its average power draw is 86 watts and its power output is 150w. 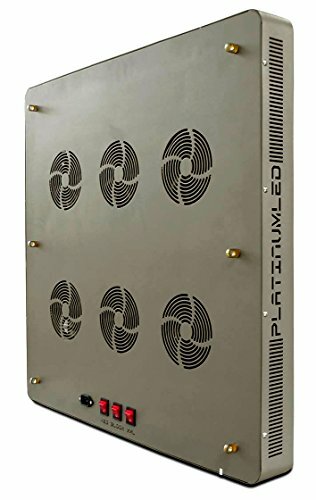 The P150 is suitable for seedlings, cloning, or closet grows. Since it uses less electricity, it won’t blind you at night. It is just like having a gentle sun in your home. Something worth noting is that the grow light produces a lot of heat, so you may have to get a fan for it. 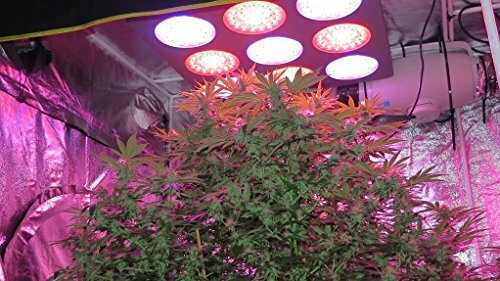 Area - 4 x 4' at 18"
The awesome quality of the LEDs used in this grow light (300 3w US-made LEDs) make it a great option for an experienced grower. It replaces a 1000w fluorescent or metal-halide light but uses approximately half the electricity (557 watts) while giving your plants 900 watts of real power. With 12 wavelengths of light, it uses a unique blend of color to promote very fast growth in plants. Other cool features we love are the control switches for the vegetative and blooming stages that ensure your plants get the light they need for their growth stage. While the grow light isn't cheap, what makes up for its high upfront cost is its awesome energy efficiency. Unlike traditional HID lights and white LEDs, it uses half the heat and electricity to produce the same amount of power. It is a versatile light that works well in both small and large settings. Area - 6' X 5,5' at 18"
It’s always a great thing to buy something that gives you great value for your money. This grow light does. Whether you’re running a small, medium, or commercial outfit, you’ll greatly benefit from the P1200. The amazing results it produces make it a must-have for dedicated growers. Your plants will respond to it almost immediately and experience explosive growth. Use this light in place of a 1400w MH light. Its power consumption is 758 watts and its production is 1200 watts. It gives your plants the maximum light they need for high yields. However, don’t use it in a grow tent as the light it emits is extremely bright and may burn your plants. The P1200 is a good companion to growers looking to grow healthier-looking plants in the shortest time possible. Your plants will maintain their red, green, or magenta colors. 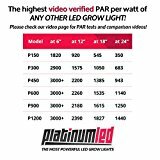 Like all the other PlatinumLED lights, it comes with a 5-year warranty. Need a grow light with a full spectrum, a large coverage, and a high light intensity? That’s the P9-XML2. It will give your plants an environment they adore. It has a full 12-band light spectrum and its intensity is up to 3 times more than that of other grow lights. When suspended 18 inches above the ground, it provides a 4ft x 4ft bloom coverage and a 5ft x 5ft vegetative coverage. Once you set it up, you will notice an immediate change in your plants. They will start flourishing, the stretching will stop, and their leaves will become dark green. The grow light is a suitable replacement for a 1000w HID light as its maximum wattage consumption is 555w and its output is 855w. The only thing we wish the manufacturer had done differently is they could have used high-quality CREE LED chips instead of single-diode 10w white LED chips as the former have better light penetration. COMPLETE *12-band full spectrum* including UV/IR + 2x White 10w CREE XM-L2 LEDs per cluster - 38% higher output than older XM-L models! 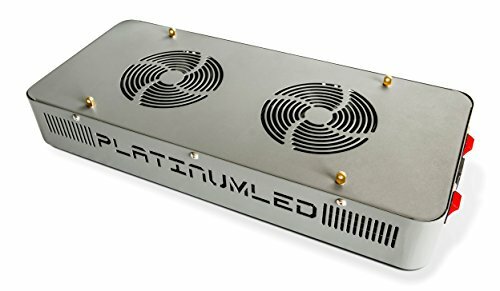 Which of PlatinumLED’s Grow Lights is the Best? 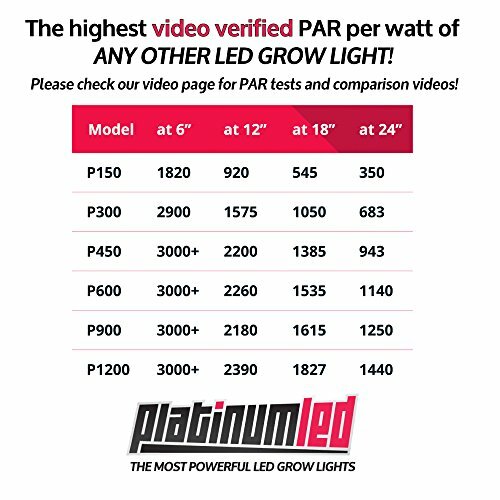 The light that takes the top spot is the Advanced Platinum Series P300. 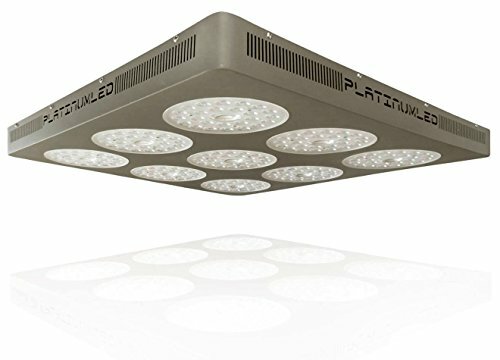 It has all the features we look for in a LED grow light: affordability, energy-efficiency, full spectrum light, high intensity, good coverage, and durability. It has the best PAR/LUMEN output per watt than other LED lights in its class and is perfect for both beginners and hobbyists. The warranty a company provides always speaks volumes about its products. 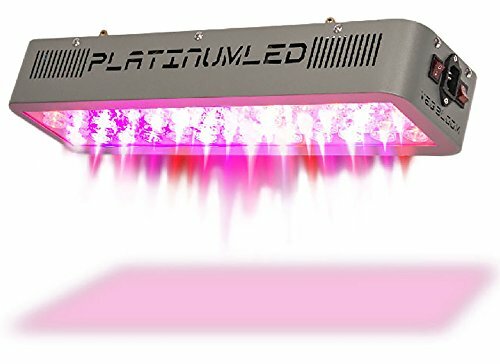 Since all PlatinumLED grow lights come with a 5-year warranty and a 90-day return guarantee, you can rest assured you’re buying a great product.